S Blade–66 has a 66 ounce face weight, and the blade is 1 3/4” in height. The color is an olive/emerald blend with brown/green thatch. This is an S-Blade, which is an engineered blade designed to have no shine. Unlike flat blades that reflect the entire spectrum of light, making the grass look white, the S Blade diffuses reflection. In theory, lounging out on the lawn offers an easy way to relax and unwind. In practice, this isn’t always the case. A backyard with real grass can get messy after poor weather. The ground may can be uneven and have dirt patches. A live lawn attracts insects and pests such as gophers. There are many upkeep tasks to stay on top of to keep your lawn looking at its best. 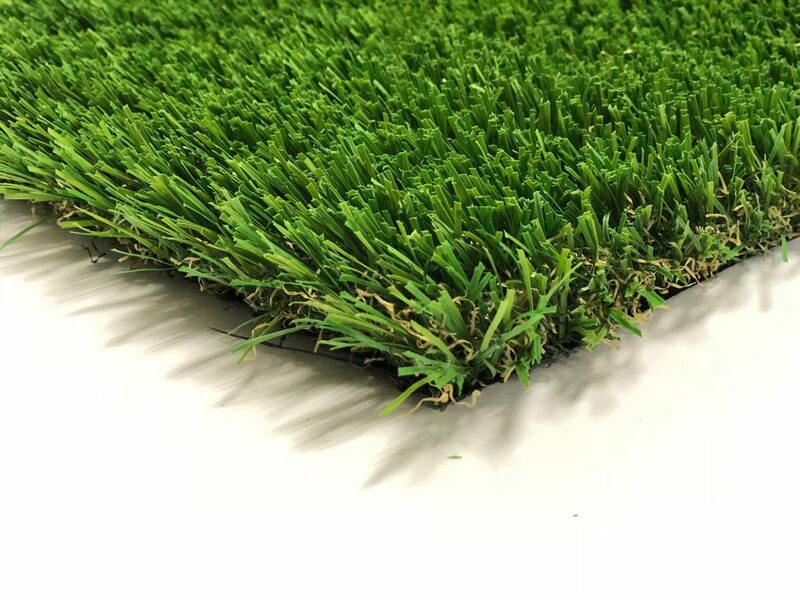 With the S Blade 66, our artificial grass for residential and commercial use, these issues are not a concern. There’s no watering, fertilizing, or mowing. Also, this product mimics the real thing. Thanks to its 66-ounce face weight, no-shine blade design, and natural color blend. These traits make it a perfect choice for homes and businesses. No matter what kind of store you run or land you own, there are many good reasons to make the switch. Like saving the cost of labor to maintain a real lawn. Or creating an indoor green space for your guests or employees to enjoy. Start today. Make your way to the nearest Watersavers Turf location and ask about free 1’ x 1’ samples. If you can’t make it to us, we’ll ship them out to you. Enjoy complete comfort thanks to residential artificial grass and commercial synthetic grass from Watersavers Turf.